Our all new Realtree Outfitters meat slicer is a must have kitchen device to make your meat slicing task all the more enjoyable and effortless. 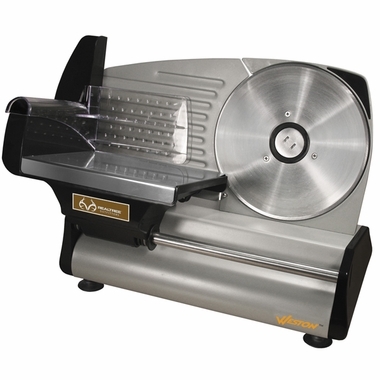 Use it in your home for slicing meats, cheese, vegetables, breads and fruits and make wonderful dishes quickly. Its heavy-duty stainless steel blades precisely cut hard meat and everything you want to slice quickly. Adjustable thickness settings from deli thin to over 1/2" helps you to adjust the thickness you need for your preparation of meat or anything. To make you satisfied with your purchase, the Realtree Outfitters meat slicer is UL and CE certified and comes with 80 watt of powerful motor for fast slicing. Dimensions: 11" x 16.75" x 12.5"